Ceaseless Power Supply: Don’t be a victim of circumstances. Instead, protect your business’ electronic equipment and information by taking advantage of a UPS backup. 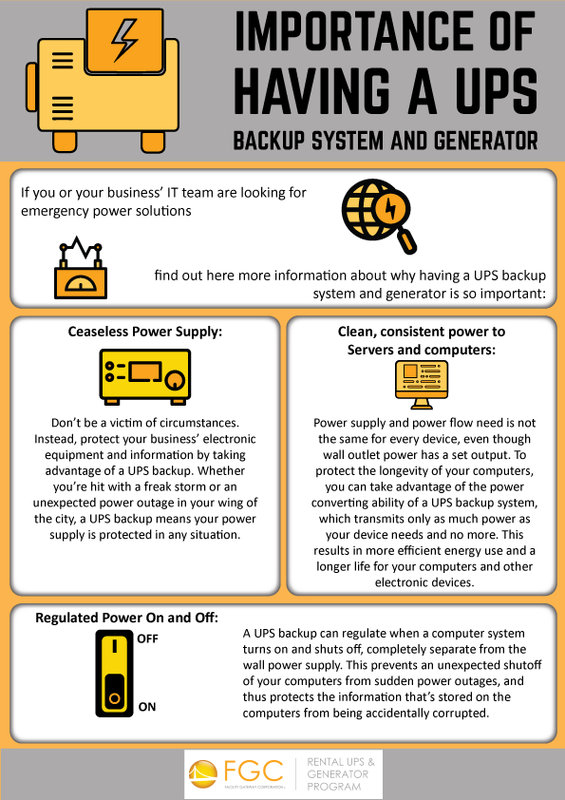 Whether you’re hit with a freak storm or an unexpected power outage in your wing of the city, a UPS backup means your power supply is protected in any situation. Clean Power to Your Computer: Power supply and power flow need is not the same for every device, even though wall outlet power has a set output. To protect the longevity of your computers, you can take advantage of the power converting ability of a UPS backup system, which transmits only as much power as your device needs and no more. This results in more efficient energy use and a longer life for your computers and other electronic devices. Regulated Power On and Off: A UPS backup can regulate when a computer system turns on and shuts off, completely separate from the wall power supply. This prevents an unexpected shutoff of your computers from sudden power outages, and thus protects the information that’s stored on the computers from being accidentally corrupted.